Walter Becker died yesterday, at age 67. Becker, along with Donald Fagen, was one of the co-founders of Steely Dan, the ever-changing band that was a dominant musical force in the ’70s and unquestionably one of the greatest American rock bands of all time. The clip above from the old rock TV show The Midnight Special — where the band is jarringly introduced by a mustachioed Bill Cosby — captures the group performing live in 1973, which is about the same time I first heard their music. The song they performed live on that show, Reelin’ In The Years, is a guitar-driven classic that was one of the first Steely Dan songs that caused me to buy their albums. It was perfect for those high school days, allowing the boys with the bad ’70s haircuts and monster bellbottoms and tight polyester shirts to play some air guitar when the song came on the radio in the car before belting out lyrics that didn’t really make a lot of sense but were great to sing, anyway. Becker and Fagen were genuises at coming up with the riffs and the obscure, tantalizing lyrics that wormed their way into your head. Like Neil Young in that same time period, they kept reinventing themselves. When you bought a Steely Dan album, whether it was Katy Lied or Can’t Buy A Thrill or Aja, or any of the other great albums they put out in the ’70s, you never were quite sure what you were going to get — but you knew it would be interesting. And you could spend hours debating what the hell the lyrics to songs like Black Cow or Bodhisattva or Deacon Blues were all about, too. Every year, on the day after Thanksgiving, I think of Steely Dan’s Black Friday, and as it plays back in miy mind it stills sounds as great as it did when I first heard it, back in college. It’s time to declare winners in our “best American rock ‘n’ roll band” poll, and it ends in a three-way tie between Aerosmith, the Beach Boys, and the Doors. Other bands receiving votes were the Allman Brothers, Creedence Clearwater Revival, the Eagles, Steely Dan, and Van Halen. In terms of hits on the blog, the most popular best American band posts have been, in descending order, Steely Dan, Pearl Jam, the Eagles, the Beach Boys, the Allman Brothers, the Doors, Rage Against the Machine, Lynyrd Skynyrd, the White Stripes, and R.E.M. Thanks to everyone for voting on this crucial cultural question! The Best American Band: Time To Vote! We’ve published a number of posts with our thoughts on the Best American Band, and we’ve given everyone time to think about that extraordinarily weighty issue. Now, it’s time for you to vote. We’ll check back in a week and declare a winner. Please, vote for just one of the candidates. Well, we started the discussion of the best American rock ‘n’ roll band with Aerosmith, and therefore it only seems appropriate to end with a discussion of ZZ Top. A bit predictable, perhaps . . . but ZZ Top, a power trio from Texas, has recorded some of the best blues/boogie rock ever. It also was ahead of its time in “branding” itself. Two of the band members, Billy Gibbons and Dusty Hill, are instantly recognizable to even non-fans through their long beards and cheap sunglasses. .
We shouldn’t let the iconic nature of the ZZ Top brand detract from an appreciation of the band’s music. I bought my first ZZ Top album, Tres Hombres, when I was in high school. The 35 years later, the music still is great. La Grange, with its quiet, ticking, mumbled intro abruptly turning into a power rock anthem, is a classic. That song was unique in that era for consisting almost entirely of taut guitar solos and drum fills, with almost no vocals. Jesus Just Left Chicago, on the other hand, shows the band’s capabilities on blues-flavored rock — also powered almost entirely by instrumental solos. By the early 1980s, when ZZ Top and its flying red 1930s coupe were staples on MTV, the band still produced great music. Legs and Gimme All Your Lovin’ are classic rock ‘n’ roll songs, and after Kish and I moved back to Columbus I was glad to find that one of the local rock stations, Q-FM 96, often played Sharp Dressed Man at 7 a.m. on the dot, as I was driving to work. There are few better ways to get a suit-clad young lawyer moving at the beginning of a long day! ZZ Top doesn’t have the same breadth of styles as other groups on our list, but the timeless quality of their music should command respect. The Ipod features many ZZ Top tunes, including Waitin’ For the Bus, Blue Jean Blues, La Grange, Jesus Just Left Chicago, Move on Down the Line, What Would You Do, Tush, Tube Snake Boogie, Rough Boy, and I’m Bad, I’m Nationwide. Edited to add: Time to Vote for your choice for the Best American Band! I admit that I am a big fan of The White Stripes. I like the simple, straightforward nature of their songs, the inventive guitar work of Jack White, the basic, garage-band percussion of Meg White, and the no-frills quality of the vocals and lyrics. And yet, for all of the simplicity of the sound, the songs seem to have lots of diverse influences — like blues, surf music, and reggae to just name a few. 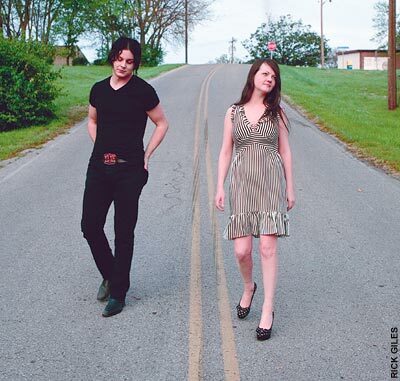 I’ve got The White Stripes on a bunch of my Ipod musical genre-oriented playlists, and there’s a reason for that. I’ve noted before that my tastes run more to the hard rock end of the spectrum, and therefore I have great admiration for Jack White’s very tasty guitar licks. Ball & Biscuit, one of my favorite songs, captures the ragged edge, live-sounding aspect of the band’s work. The guitar on that song variously utilizes feedback, distortion, and picked-out solos, and then returns to a basic blues riff with a bit of a twist. The song isn’t sung, it’s muttered. The percussion sounds like it has been pounded out on the bottoms of overturned metal ashcans. I’ve written before that I listened to Lynyrd Skynyrd’s Call Me The Breeze before law school exams to get me ready, but I think if I were taking a law school exam these days Ball & Biscuit might be a contender. It demands cranked-up volume and some air guitar work on the part of the listener. The same group then can record a sweet song like We’re Going To Be Friends, a paean to first-grade friendships, or Hotel Yorba, which is pretty hysterical. Go figure. The Ipod speaks very well indeed of The White Stripes. I recognize that Richard might be harshly critical of this notion, but I think any group that has recorded songs like Ball & Biscuit, Do, Hotel Yorba, Rag & Bone, In The Cold Cold Night, It’s True That We Love One Another, One More Cup of Coffee, Offend In Every Way, I Just Don’t Know What To Do With Myself, and Seven Nation Army — among many others — is an easy finalist. The Best American Band: R.E.M. R.E.M. has had a long and distinguished career. The band clearly has its roots in the 1980s — and the early ’80s at that — but its stripped-down sound and lyrics reflected a sharp departure from the more frivolous songs of that decade. Many of R.E.M.’s more memorable songs have stories to tell and do so with an interesting, quiet intensity. So, Central Rain and (Don’t Go Back to) Rockville are good examples. At the same time, in other songs the band managed to combine humor and political commentary, such as in The End of the World as We Know It, Orange Crush, and Man on the Moon. And, of course, where would TV dramas be without Everybody Hurts being played at some crucial moment of character angst and self-awareness? I expect that song is one of the most oft-played in TV history. Although the topics of R.E.M.’s songs are diverse, the band’s sound remains easily identifiable. Credit must be given to any group that had more than a decade of extraordinary success, managed to record songs that mention professional wrestling and soft drinks and feature a not-bad Elvis impression, and ultimately produced a very strong body of work over a series of albums. The faithful Ipod reflects the high quality of R.E.M.’s offerings, including songs like What’s the Frequency, Kenneth?, Radio Free Europe, Talk About the Passion, So, Central Rain, Fall on Me, The One I Love, It’s the End of the World as We Know It, Stand, Man on the Moon, and Orange Crush. Oh, and one other thing — even if you don’t have the greatest vocal range or talent, you can still sing along to R.E.M. songs. I must commend a band that records in an accessible key.